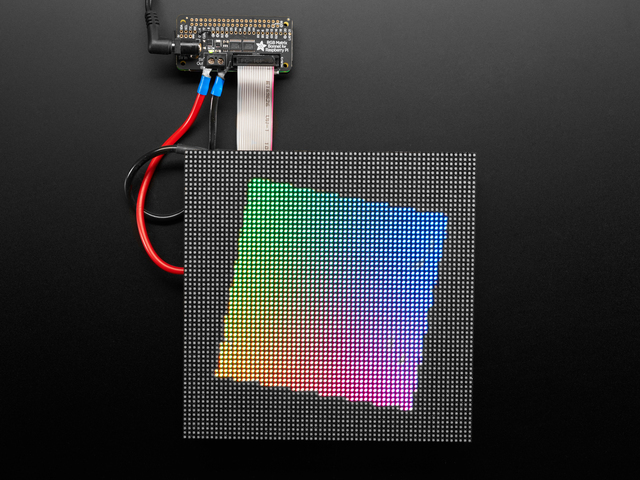 You can now create a dazzling display with your Raspberry Pi with the Adafruit RGB Matrix Bonnet. These boards plug into your Pi and makes it super easy to control RGB matrices such as those we stock in the shop and create a colorful scrolling display or mini LED wall with ease. "Bonnet" boards work on any Raspberry Pi with a 40-pin GPIO header — Zero, Zero W/WH, Model A+, B+, Pi 2 and Pi 3. They do not work with older 26-pin boards like the original Model A or B. Note with the Pi Zero you may need to solder a header on the Pi board; it’s normally unpopulated on that model (except the “Zero WH”). We also have a HAT version of our RGB Matrix design. The HAT version does not come fully assembled, but does include a real time clock (RTC). Simple design - plug in power, plug in IDC cable, run our Python code! 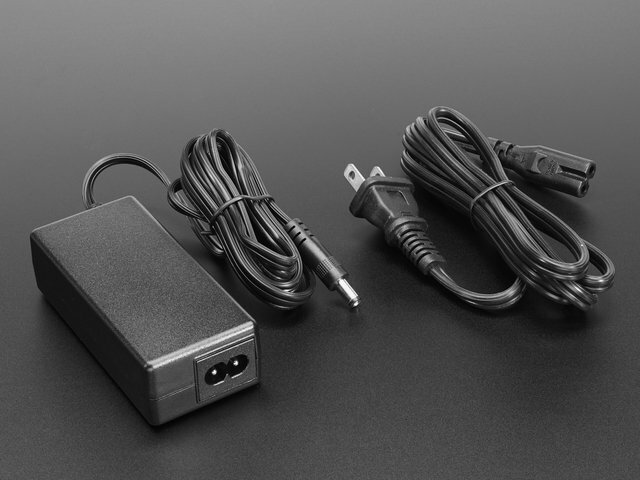 Power protection circuitry - you can plug a 5V 4A wall adapter into the HAT and it will automatically protect against negative, over or under-voltages! Yay for no accidental destruction of your setup. Fully assembled compact design no soldering required! Plugs onto any Raspberry Pi with a 2x20 connector, and you're ready to glow. Works with any of our 16x32, 32x32 or 32x64 RGB LED Matrices with HUB75 connections. You can also use 64x64 matrices by soldering a small jumper on the PCB. Want more lights? No problem, chain multiple matrices together for a longer display - we've only tested up to 32x128 but it works just fine. The bigger the display the harder it is on the Pi, so keep that in mind if you're using a lower-powered Pi Zero. Please note: this Bonnet is only for use with HUB75 type RGB matrices. Not for use with NeoPixel, DotStar, or other 'addressable' LEDs. A 5V power supply is also required, not included, for power the matrix itself, the Pi cannot do it, to calculate the power, multiply the width of all the chained matrices * 0.12 Amps : A 32 pixel wide matrix can end up drawing 32*0.12 = 3.85A so pick up a 5V 4A power supply. 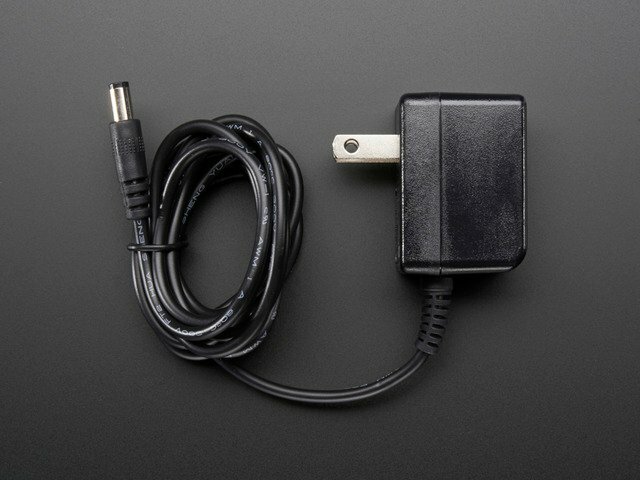 We also stock 5V 10A power supplies. Actual power usage will vary with how many LEDs you light up at once. This guide was first published on Feb 14, 2018. It was last updated on Feb 14, 2018. This page (Overview) was last updated on Apr 26, 2019. Dance the cold away with this wacky snowman!